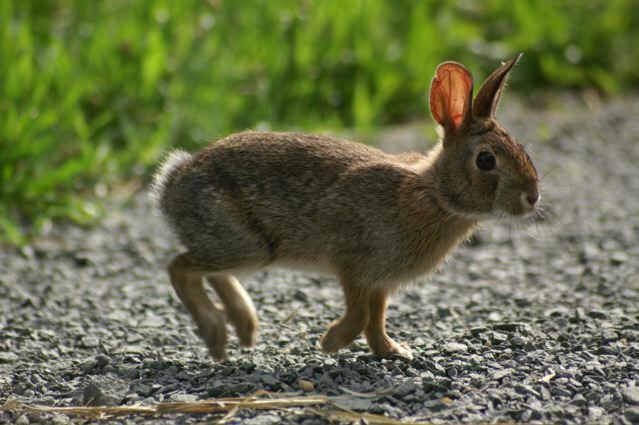 The New England cottontail has been designated as a candidate species for listing under the federal Endangered Species Act, according to Mass Wildlife. The population has declined sharply during the past 25 to 50 years, officials say, and the rabbit is now considered imperiled. One reason for the eclipse, says Tom French an assistant director of the division, is the rise of the Eastern cottontail, a species imported by state officials in the early part of the 20th century to benefit hunters. Fire has also played a role in the disappearance of the New England cottontail — no, not because we’re having fires, but because we’re not. The New England cottontail thrives in areas of thick vegetation, the type likely to spring up following a fire. Our local cottontails are doing best on Cape Cod, said French, because of its sandy soil and scrub vegetation. I wonder if the rise in the predator populations since Massachusetts banned effective means of trapping has affected the New England cottontail population? The ballot referendum which passed in 1996, banned the most effective types of traps, such as leghold traps and snares which gave rise to the populations of fox and coyote in the state.